Sometimes the detritus in our lives clutters up more than just the space it lives in. This is true for the tangible, and often, intangible stuff we cling to because we don’t know any better than to not let it go. A hoarder finds comfort in the piles and piles of stuff they accumulate, unlike the rest of us, including myself, who start to feel claustrophobic and do I dare say, anxiety ridden. Granted, you can’t shove 10 pounds of stuff into a five pound box. It doesn’t work because the excess just oozes out and makes a real mess. This is your sign to purge, but be aware that as fast as you shovel it out, you risk the urge to let more stuff come in. And if you’re not paying attention, I swear it will multiply…exponentially! Seriously, despite the chaos of life, you really do need to stop once in awhile and go through the piles before they overrun your life and take on one of their own. Truth be told, somethings you need to downsize the external piles (the tangible things you can see) before you can let go of the internal piles (the intangible stuff we cling too). Clearing out the clutter that surrounds us can be very cathartic and liberating. And while it might seem overwhelming at first, I find the best thing to do is to take it one pile at a time. Once that first stack is done, then I tackle the next one. Before you know it, a whole section of the house is cleaned up. Now I know you’re probably thinking why don’t you pick things up immediately instead of waiting until the stacks get so high that they topple over. Unfortunately, not all of us are able to manage this way of life when you work 14-16 hours a day, have a two hour commute and need to sleep. This is not an excuse; it’s just the way life is for some of us. 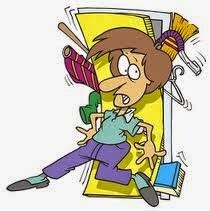 So before the piles inside your home get out of hand, make the effort and downsize. It doesn’t matter how long it takes, just make a start. Believe me, you’ll feel better before you know it. By now, I am pretty sure you’ve figured out what I am currently doing…and believe me, I have piles and piles to go before I’ll sleep better. I know that changes in life are difficult, but before you are able to rid yourself of the intangible stuff you’re clinging to, you need to break free from the tangible stuff piled around you. Just take it one stack at a time. I know you will get through this and so will I.